Note: Version from mainsite is v2.99. "Hailing from the southern lands, Steiner appears to be nothing more than a tiny common man. However, it is this Little Fighter who took down an entire bandit gang by himself, blasting his enemies with hadoukens and then blinking away before they can react. Having arrived in Lion Forest, Steiner joins the other Little Fighters in their adventure. Does he have what it takes to defeat the mighty Julian?" Steiner is a representative character of myself, based off my own playstyle in LF2. He is a mix of things I liked of various LF2 character, and his style is influenced by Akuma from Street Fighter and Vergil from the Devil May Cry series. Steiner started off because: A) I got frustrated at LF2's Stage mode forcing you to rely on building up an army, and B) Something felt missing in each LF2 hero. So I decided to make a character representing myself - both in character and in playstyle. After MANY major revisions, I've finally arrived at Version 2.99 as of this post. The end result is a character who doesn't hit hard and lacks reach, but is surprisingly agile and good at breaking defenses - an excellent duelist and not too bad at crowd control. Put the "STM" folder in LF2's "data" folder. Put the "ai" folder and ddraw.dll in LF2's main folder. Hailing from the southern lands, Steiner appears to be nothing more than a tiny common man. blasting his enemies with hadoukens and then blinking away before they can react. Having arrived in Lion Forest, Steiner joins the other Little Fighters in their adventure. Does he have what it takes to defeat the mighty Julian? Steiner is quite a powerful yet agile fighter, but uses a lot of mana and has trouble chasing down faster enemies. Grave Fist	=	All of Steiner's melee attacks(except grab) can hit more than 1 opponent. Stone Carrier	=	Steiner automatically blocks certain attacks while carrying a heavy weapon in front of him. Rolling Stone	=	Steiner can roll along z-axis slightly, and also roll backwards instead of forward after flipping from mid-air. Draw Strike	=	Steiner's weapon attack animation is quite unusual, notable for having extra-long range compared to most fighters. Grab Direction	=	Steiner can change the direction he is grabbing his enemy. 1. Punch	-	similar to Woody; fast x3 stun. x2 to break defense. 2. Run Attack	-	similar to Bat; blocks attacks initially, then charge forward to punch. Can move along z-axis. 4. Dash Attack	-	a kick that hits twice; the first hit is more powerful. All special moves can be used while running (press all 3 keys at the same time). * Hold (<) to Charge; does NOT work if F6 is enabled! * As long as you have a minimum of 100mp, you can use up to Charge 3. Charge 3	=	Power Blast	(pierce enemy only)	[164mp / 33%]	; a bit like Freeze's icicles; pierces multiple enemies/weapons & small chance to pierce weak projectiles, but otherwise destroyed by a simple nudge. +A	=	Crash Bomb	(Julian-like D>J)	[295mp / 59%]	; timing the input is important, or else you'll fail. This charge level is not required for Hell Move (i.e. DJA only, not A+DJA). or	+DJA	=	Destruction Wave	[529mp / 106%]	; Hell Move only usable if you have less than 100hp & have full mana, plus some input timing. You can continue holding < to delay shooting the hadouken. * Can reflect John's energy disk! Destroys those that cannot be reflected. * Can be used while grabbing enemy or combo from Blink. +D>A/D^A/DvA	=	Flame Shot (short range pierce)	[50mp / 10%]	; if enemy is already on fire, it will still hit but deal 0 damage. * Instantly teleport a short distance with D>J/D^J/DvJ. * Can be used while grabbing enemy or while in mid-air(will always teleport toward ground) or while rolling. * similar to Blink, but you don't move at all & remain invincible when re-appearing. * Cannot combo with +J Mana Burst. Does not teleport towards the ground in mid-air. 1. AAA A D>A	:	Very basic combo. The main benefit is that if enemy tries to flip, he'll immediately get stunned. You can also charge D>A to L2 for slightly more damage but no stun. 2. JA >JA	:	Time air-hadoukens when near ground. Combo most effective if enemy's back is facing you. Hard to do; not very practical. 3. DvAA D>JJ A	:	Woody-style combo. Recommend grabbing enemy before doing this. 2nd Combo Shot can be replaced by Flame Shot if you want as a finisher. No, you cannot chain this 3 times in a row. 4. JA D>JJ <A	:	Follow-up for air hadoukens. Depending on enemy position, you'll need to adjust the Combo/Flame Shot to face left/right, maybe even chain into Combo #3! 5. >>J<A D<J Grab	:	The best way to follow-up the air-stun, since Steiner's dash is generally too short to maximize the >>JA damage and walking/running takes too long. These are things that I can't really fix without negatively affecting the character, and they are mostly LF2's fault rather than mine. 1. As mentioned above, you cannot charge Hadouken if you use the F6 cheat. This is a common LF2 bug; try cancelling Firen/Firzen's D>J with back instead of D/J and you'll see why. 2. If you charge Hadouken past 0mp, your MP becomes negative and so you cannot attack properly. Use Punch/Jump Attack to reset your MP to 0. This is a common LF2 bug. 3. If you stand at edge of map & shoot a hadouken towards it, your weapon may disappear! BE CAREFUL IF YOU ARE DRINKING MILK! This is a common LF2 bug, mostly Firzen dashback or almost all characters trying to roll into edge of map. 4. If you swing certain weapons at edge of map (but facing away from it), your weapon may disappear as well. 5. When low on MP, using D<A or D<J(press all buttons at the same time) while running will cause you to roll/dash backwards! This bug is commonly seen in Bat. 6. When low on MP, using D<J while rolling will cause you to rotate & thus roll backwards mid-animation. This bug is commonly seen in Deep. 7. Pressing DA together when landing from a jump will cost MP but you'll also roll very slightly earlier. This bug shouldn't happen to you unless you are deliberately doing it, and its basically a variation of the same bug as Louis/Henry/Rudolf. [*] Went back to x3 hits to stun with punch, but retain x2 hits to break defense (mostly to deal with Knights). [*] Stats have been nerfed, but light weapon throwing is more accurate and Steiner actually jumps/dashes better than before. [*] Some wpoint locations have been changed, for better and for worse with regards to a certain weapon-disappear-on-edge bug. [*] Grab+J Upthrow and D^A Anti-Air Hadoukens have been removed; they don't add to the character. [*] Can no longer blink towards the air, not even from Super. Its simply way too overpowered; too mp-efficient & unavoidable regardless if you flip or not. [*] Can no longer use J+A to run attack. This double input method is not good with characters who potentially reach negative mana, plus run attack is pretty overpowered to be used without running. [*] Run Attack is slightly stronger but less movement range and can block attacks during startup. Dash Attack damage is mostly transferred to the 1st hit, 2nd hit is arest instead of vrest. [*] Can no longer roll from all landing frames. However, Steiner can still roll in the opposite direction(even with F6 enabled!) when landing from state 6(flipping or air hadoukens) & along z-axis. [*] Can blink while carrying a heavy weapon and will now blink together with grab victim. Blink D^J/DvJ no longer requires holding ^/v to use. DJA is a new no-movement more-invincibility blink. [*] Burst is stronger but slightly slower & costs more mana and combos into weaker shorter-ranged hadoukens. Burning Hadouken makes a return here. No more infinite Burst combos, but you can still chain them quite a bit like Woody. [*] Hadouken now has effectively double the initial mana cost, matching Freeze's D>A. This should make hadoukens(including charged ones) a lot less spammable. Charging system is also a lot more precise. [*] Charged hadoukens rebalanced; weaker in general. The new Level 4 charge can pierce multiple enemies/weapons, but a very high chance of being destroyed if punched or hit by a weak projectile or thrown weapon, very much like Freeze's icicles. [*] Added +A input for Level 5, which is the old Level 4 with some buffs to make it very similar to Julian's Soul Bomb. Unlike the previous charges, this one costs a LOT of mana and you NEED to have the minimum mana required and be in Level 4. [*] Hell Move input changed. It no longer costs HP to use, but it requires you to reach Level 4 and have full MP while less than 100hp. It should also no longer double damage from both the ball & the explosion. Steiner is a representative character of myself; based on my own playstyle and elements of what I liked from several LF2 characters. Originally made to deal with Stage mode spamming enemies/projectiles, and because I felt the original LF2 characters were missing something. I'm proud of his hit_back charging system and the fact that Steiner only uses 2 IDs(char & 1 ball) where most would need way more for the same feat. Thematically influenced by Akuma from Street Fighter and Vergil from the Devil May Cry series. BluePhoenix - The awesome admin who hosted this character on LFE's mainsite & helped me discover things about LF2. MH-LF2 - For creating Little Fighter Empire. Ramond - For DC advice & discovering new things about LF2. YinYin - Tester & DC Advice, base sprites for burning/ice. zort - For telling me interesting bugs about LF2 I can learn to exploit. stm_exp.bmp sprites are modified from DR.LF2 by In_The_End. "Hell Move" effects(sflash.bmp,107.wav & data) are taken from R-LF2 by Conrad Leung. @Dr A (below): Thanks, I've seen that thread and I'm hoping to do that for my sprites, that's why I'm drawing out the individual parts of the character first. I haven't used Photoshop before though, currently using MS Paint. for char generator STM char will loose its "pixelness"
(03-10-2015, 03:18 PM)Mono Wrote: for char generator STM char will loose its "pixelness"
(03-10-2015, 09:01 AM)STM1993 Wrote: @Dr A (below): Thanks, I've seen that thread and I'm hoping to do that for my sprites, that's why I'm drawing out the individual parts of the character first. I haven't used Photoshop before though, currently using MS Paint. Oh, it's not Photoshop, but Macromedia Flash. @Mono: I doubt he'd like to keep the pixels though :P.
I'm not too worried about the sprite quality when doing the part placement though, it won't be too hard to touch up once the character's stance is in place. 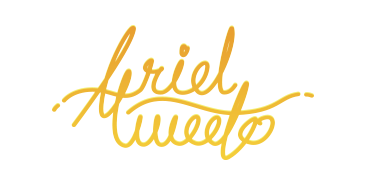 Anyway, I just got Photoshop CS6, figured out rotation, transparency, a bit on layers - but still have no idea how to flip images. I guess this is a start (left is what I manually drew out on MS Paint by tracing Davis, right is placing parts(without editting the length etc). This is after adjusting each layer. I noticed rotation isn't very reliable; I can't get the pixels to form exactly the way it shops on Photoshop, in practice it'd always realign a bit strangely. Also a little annoyed at how to accept/cancel changes; would appreciate some shortcut buttons. Slowly but surely. New standing/breathing frames. Next up will be walking & running. I'll remove the black spots at the end of it all. EDIT: Knowledge on how to easily/quickly remove black spots with Photoshop CS6 will be appreciated. Magic Wand is rather finicky. * Updated standing legs. Deliberately blur sprites that would otherwise look perfectly sharp. * Walking, running, stop_run, rolling, defending, start of jumping done. * Corrected running centerx; I initially thought I made a spriting error. The base sprites for frozen & burning is taken from YinYin's character guide. * STM can flip completely upright in mid-air, so he can counter with a fireball after flipping. He loses invulnerability if he counters though. * STM can flip on the z-axis, which allows him to avoid getting combo'd by balls in stage mode. * STM's air fireballs have state 6, so unlike other characters, he can dash after performing a jump attack, or even dash non-stop(he can shoot backwards after dashing like Henry) as long as he has mana. * STM can roll after a dash. He can't roll infinitely or roll out of lying though, those are given a separate crouching frame. * STM carries heavy weapons directly in front of him, allowing him to naturally block some hits. He also throws straight forward, so short enemies directly in front of him can still get hit. 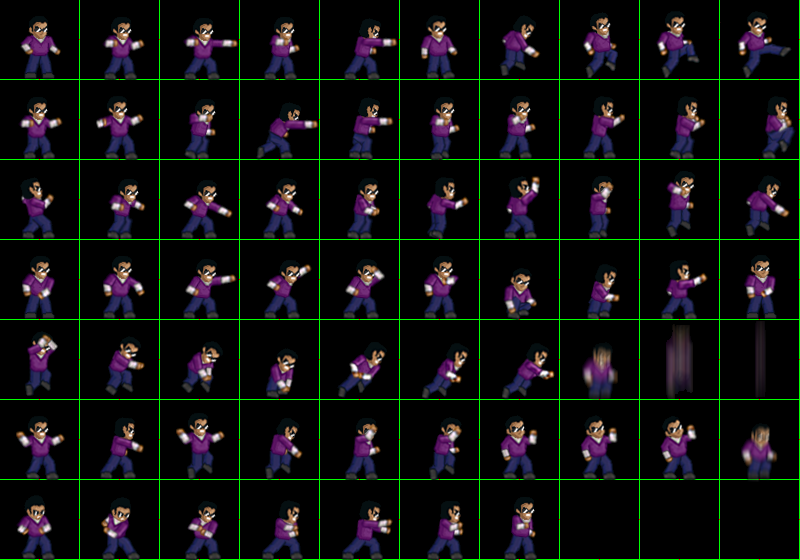 Cleared most of the black spots in 1st sprite sheet. 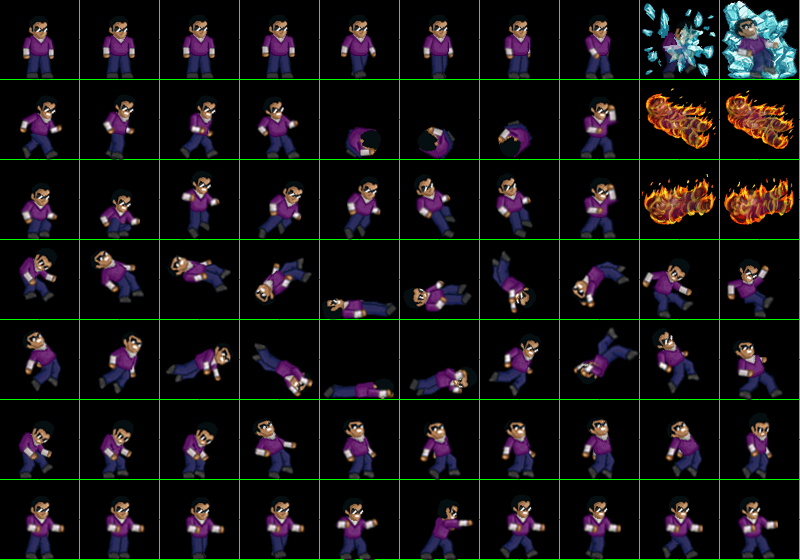 I've started working on 2nd sprite sheet as you can see in the video; punch/super specifically. 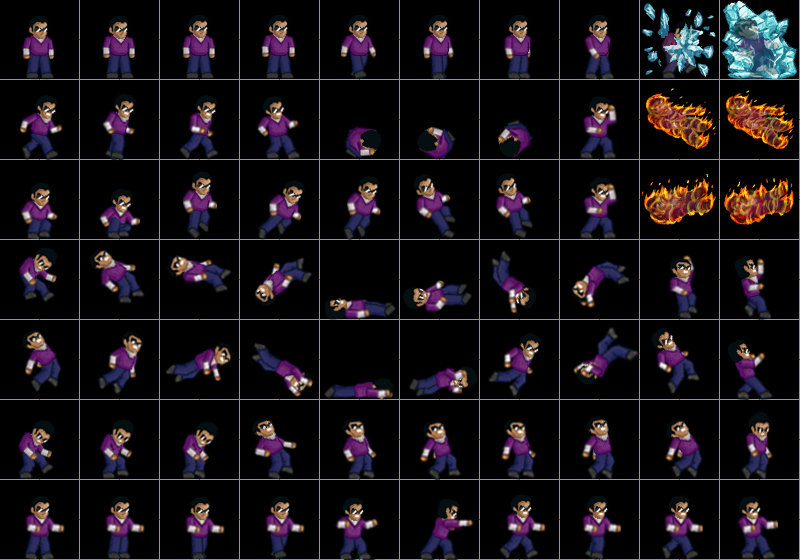 Finished all basic moves sprites + DvA, except light weapons (which I'm planning to do something different). Taking a break due to life commitments and faulty main PC's monitor. Ground weapon attack done. It is also the new DvA attack sprite. I decided to revamp STM's planned moveset. Details in 1st post, but basically I'm gonna make STM focus more on basic attacks but with powerful utility special moves. Take note this is still a beta, so there is plenty of polishing to do before its 100% complete. I haven't even added the proper hadouken ball, its currently Freeze's ice ball since that's the projectile speed I'm going for. 2) Coordinates(bdy/bpoint/wpoint/itr) for standing, walking, running and all weapon-specific frames. I may consider adding a healing move in DJA, but that's low priority. Everything completed. 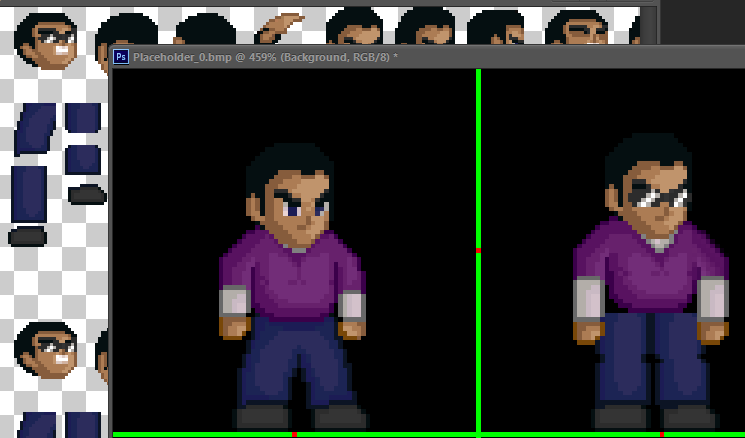 Final touchups, slowly removing black spots, making b_sprites. Most likely release on 1st April 2015, but its not an April Fool's joke. The area around the elbows look too stiff and straight. Wouldn't hurt if you went over it and let the white shirt (?) curve a little. It should follow the shape of the arm, not be a straight box. Overall it looks somewhat alright, not all too amazing, but pretty okay. Although if you cleverly copy-paste the upper body of a LF2 character, I think you could increase the quality of the sprites a lot. STM Wrote: * STM carries heavy weapons directly in front of him, allowing him to naturally block some hits. He also throws straight forward, so short enemies directly in front of him can still get hit. This sounds like a pretty cool idea! I once wanted to do this myself for Jules, I think. Ended up looking a little funky if you change direction while holding a weapon (the weapon would make a weird "jump" then), but maybe you can somehow avoid that with DCing. (03-16-2015, 03:21 PM)Lauli Wrote: The area around the elbows look too stiff and straight. Noted, but I doubt I'd be changing that because I can't really rotate/transform the arms to fit any better. The sprites are all done by simply copy-pasting the individual limbs and then rotated until I think they look good. 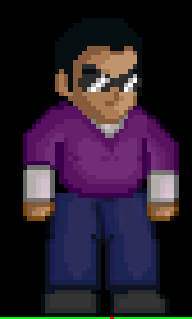 Maybe a future sprite update I'll improve on that. I have considered pasting over a standard LF2 character, but I wanted him to have a more unique animation. I've started working on 2nd sprite sheet. Here's a short video, enjoy! Current time: 04-24-2019, 06:58 AM Powered By MyBB, © 2002-2019 MyBB Group. Theme created by Silverthorn.